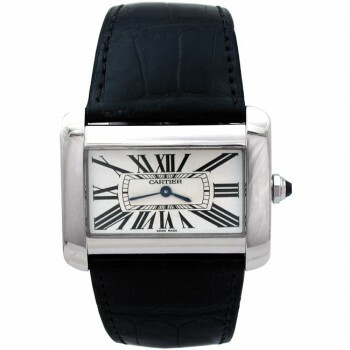 The world-famous Cartier Tank, which debuted in 1917, is a watch which is immediately recognizable on any wrist. The Tank Divan is the horizontal version of the original Tank design, creating a new look which is not only stunning, but also better suited for smaller wrists. Undoubtedly the most popular Cartier watch ever created, the Tank has bedazzled wrists since it was introduced in 1917. The watch was designed by founder Louis Cartier himself, who got inspiration for the watch from army tanks being used on the Western Front during World War I. Since then, the Cartier Tank has been worn by icons such as Jackie Kennedy, Princess Diana, and Yves Saint Laurent. Featuring its signature square dial with Roman numeral hour markers and bracards which seamlessly integrate the bracelet with the dial, the Cartier Tank is a legendary timepiece which represents the pinnacle of watchmaking. Introduced in 2002, the Tank Divan took the originally vertical shape of the Tank and made it horizontal, creating for a very unique look which also fit smaller wrists a lot better.